It gives me a lot of joy and contentment to find pleasure in something simple. Just before sitting down to write, I decided to spend a few moments sitting in a chair in the back yard in utter silence just listening to the world around me, soaking up the milder rays of the warming sun (and some much needed vitamin D). And just from those few, precious moments that I gave myself for refreshment, my spirit feels calmed and quieted; it feels lifted up. I feel at peace, and full of gratitude and awareness for the gift of a simple pleasure, and what it can do for me. Autumn awakens my sentimental side; it seems far more melancholy (the good kind) than summer ever would be, and I guess I kinda like that about it. It coaxes me into daydreams, and sets my imagination ablaze with images of how I’d like to spend my quiet moments, whether curled up on my couch in the evening in my robe with my Kindle, reading; or in the kitchen preparing some fall-inspired fare for the people in my life that I love and cherish. For me, there’s a simple pleasure in the reddish-golden sunset of the fall, and in the plethora of orange and yellow butterflies that I see touch the petals of the fall flowers. There’s a simple pleasure in the way that the water in a small pond reflects the light, making it look like little particles of stars that have fallen to earth; or in nature, this complex magnificence that surrounds us that God has provided us with, where we can search out our Creator’s hidden qualities as to better understand and experience Him. Simple pleasures are found in the very food that this season provides us with in the golden-orange, green and red offerings that it births. The flavors are familiar and perfect for what a soul in the autumn longs for. 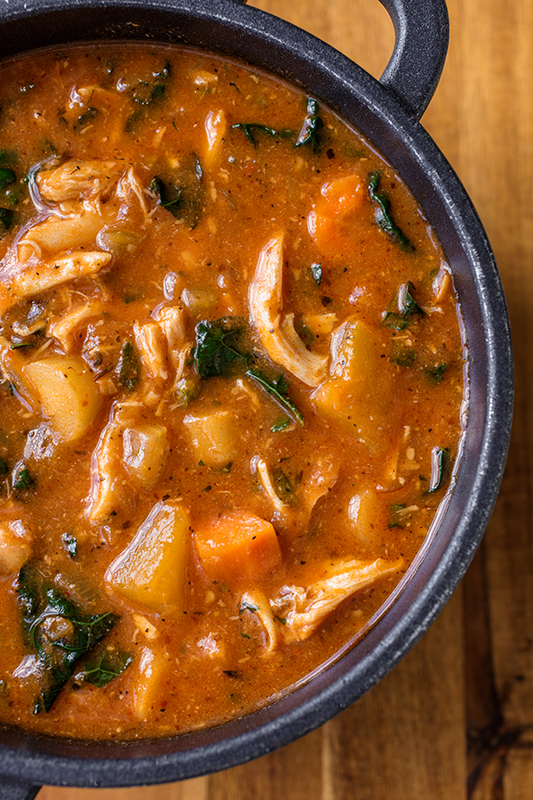 Each bite of a hearty Italian chicken and autumn veggie soup contains little bursts of fall; it contains little tastes of the very best elements that it produces. 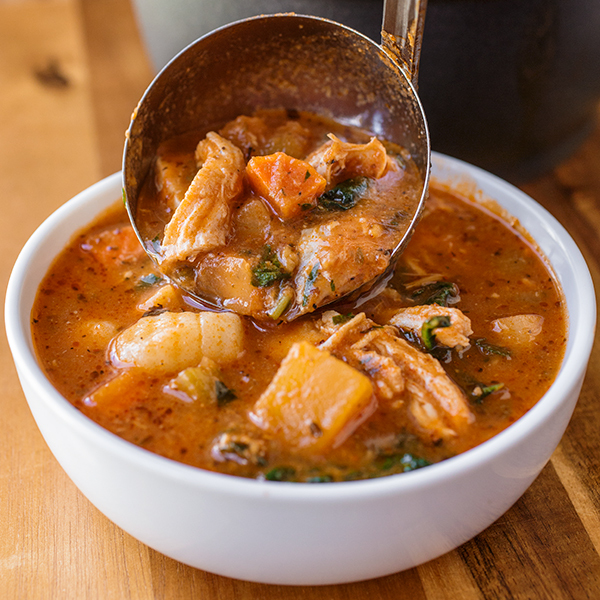 And the simple pleasure found in a bowl of this earthy soup feeds not only the physical part of us, but the inner, quieter part that longs for a connection to that which is greater than we are—to the One who’s hands gave shape to what we ingest and use as sustenance. A few moments of peace and quiet in the autumn afternoon sun can do wonders for one’s spirit, just as a bowl of colorful and savory autumn soup can. And there’s nothing complicated about these things; they’re just a pair of simple pleasures that make everyday living that much more delicious. And for those simple little things, I hope to remain forever hungry, and forever in gratitude. I’ve been following a long time but haven’t commented til now. WHAT A SOUP. I appreciate your comment, Kiara—thank you! And thanks for following! Hi Ingrid! Looks like another wonderful recipe I can’t wait to try! I have a question though, when you say 2 bone-in, skin-on split chicken breasts, does that mean 2 whole breasts (4 individual total) or 2 half breasts (2 total)? Hi Alisha! Great question, and I’m glad to have a chance to clear that up in case anyone else will wonder; it’s 2 half breasts, or 2 total. I really do hope you try this soup out, and thank you for stopping by! Thanks Ingrid! I’ll be shopping for the ingredients today. And I also have your Apricot-Pineapple Sticky Chicken over Toasted Rice on the menu for next week too – it’s my second time cooking that and it is just delicious!!! First time visitor and just had to make this soup when I saw the pictures. So glad I did, it was fabulous. I just had to add 2 more cups of stock since I had two large bone-in split chicken breasts. I served with garlic bread. Family loved it. I will be making again throughout the winter. Lorrie, that’s fantastic—I’m thrilled that you and your family enjoyed this soup, and that you plan on making this again to keep you all cozy-comfy during the winter! Thanks so much for stopping by; and I hope you can find a few more soups/stews or other warming recipes to try out, as well! hi, this soup looks delicious- but unfortunately is not vegetarian- any suggestions as to what I can replace the chicken with? Hi there! Great question—you can substitute vegetable stock for the chicken; and as far as the chicken meat is concerned, you can just leave it out; or, substitute some ground soy (it looks like ground beef, and can be found at Whole Foods Market or Trader Joes) if you’d like a little texture. Also, you could substitute seitan, which is meat-like, as well. Hope you enjoy! Thank you for the lovely soup recipe. I am so pleased that I came across this recipe! My whole family loved it! It also made quite the impression with all of its lovely colors and aroma. It sure involved a lot of chopping but I found it to be the best soup I have ever made by far! Ana, I’m so very happy to read that! Yes; there’s a bit of extra elbow grease involved, but as you can taste, it’s so very worth it in the end! Thank you for your comments. The best soup I have ever made. Donna, that warms my heart just reading that! Thanks so much for sharing with me! EDIT: Sorry, I just noticed that they are to be roasted. Still…that’s a lot of garlic. But not as bad as putting fresh garlic in. I generally think the more the merrier when it comes to garlic! So excited to try this soup, I’m making it for everyone tonight. It looks so yummy! Yes!! 🙂 I really think you’ll enjoy this, and I’d love to know how it turns out for you, Andrea! This looks delicious but I’m not a huge fan of gnocchi. Can that simply be left out or would you recommend a substitute? Hi Katie, they can totally be left out. I would suggest that you use a favorite type of pasta as a substitute—perhaps little ditalini, macaroni or even orzo would be good! Hope you enjoy! This soup looks fantastic! Do you think it will freeze well? Thx! Hi Emily, I think it would freeze just fine! 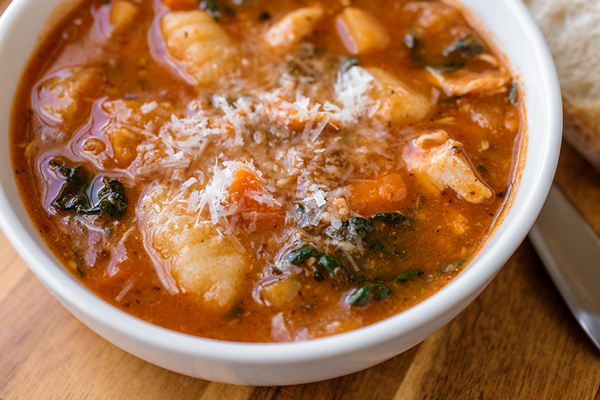 I would skip freezing the gnocchi, though, as their texture may become gummy and strange; just prepare those at the time you plan on serving the soup, as they’re super quick to cook, anyway! Hope you enjoy. The soup was what I came to see, but your words about autumn and taking a moment to appreciate what God has given us was the true treasure here. Thank you for that. Aislinn, I really appreciate your comments. Thanks for that. And I truly do hope that you enjoy this warming and hearty soup, as well! Wow! What a terrific recipe! So beautiful, hearty and healthy. The roasted garlic makes it. I am especially in love with your chicken breast method. You get so much more flavor out of them cooking them that way, not to mention it’s cheaper. It was so tasty I had to stop myself from eating all it. Thank you so much! This will definitely be making its way into the rotation. Jill, thanks so much! Yes, the chicken keeps a lot more of its flavor; and when a method is more cost effective, that’s always a plus, right? So glad you enjoyed this recipe, and thanks for sharing your experience with me! Hi Melina, so glad you both enjoyed the soup! My pleasure to share it, and thank you for taking a moment to let me know how your experience with it was! Your blog was spiritually lifting for me. I’m making this soup this week. It sounds wonderful. Autumn is my favorite time of year and makes me want soup!!! Robin, your words mean so very much! 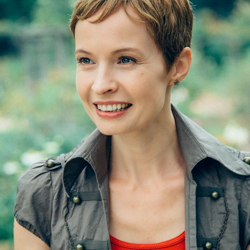 Thank you for stopping by to share you thoughts, and I’m so honored that you were uplifted. I hope that you will enjoy this recipe, and feel comforted by it! I’m making this soup right now, it smells so delicious. Can’t wait to taste it when it’s all done. I’ll hope to be making this frequently. Thank you, its a wonderful recipe. Hi Suzanne, I certainly hope you enjoy the recipe! And thank you for your kind comments! I must admit when I read 3 heads of garlic I also thought WHAT! So glad I trusted you! This soup is fantastic! I substituted spinach because I didn’t get out to the garden before dark, tasted great but will definitely use kale next time! 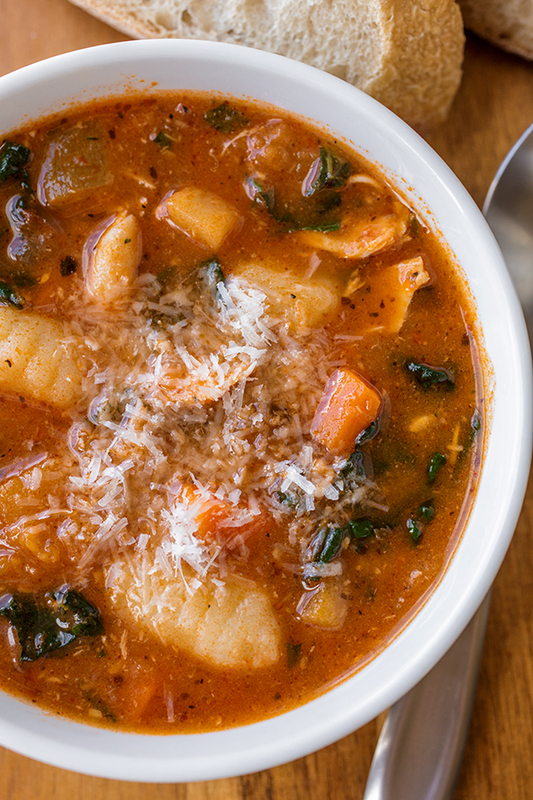 This soup is so healthy that I couldn’t bear to add the gnocchi. I may cook up some farro or quinoa next time, but felt it was hearty enough without. Hi Vanessa, glad you trusted me, lol!! 😉 I’m thrilled that you enjoyed the soup, and the farro or quinoa would be a great substitute. The best soup…ever! I make soup all the time, but this one was started in my cast iron skillet; and I believe that made a huge difference. Love it.. who knew cheese rind was part of a soup. Thank you ..my family will enjoy this for a long time. Nadine, that is awesome! So glad you and your family enjoyed the recipe! Thanks for taking a moment to share your experience with me. Omg this sounds so delicious, can’t wait to make it for my family tonight! I discovered your blog through this recipe so I’m excited to test out some more from your collection! Thank you for such a great post! Jessica, I’m excited for you! 🙂 So glad you’re making this, and I’m looking forward to you trying some of my other tasty recipes. Thank you for stopping by! I’ve been making this soup for a year now. My family LOVES it. It is seriously so good! Thank you so much for sharing the recipe! First time visiting your site! I’m going to make this tonight and I’m super excited. Been searching for a go-to veggie soup and everything i find just looks boring and bland. Can’t wait to try your recipe out! I made this today, I used olive oil instead and I also added a SWEET POTATO, I like to add sweet potatoes to my soup. Normally I would of used my own Bone broth but did not have any made, I will do it with that also. This is a keeper my husband said. Thank You for a wonderful recipe. I also used your recipe on my page and gave your name The Cozy Apron. Hi Aletha, I love your addition of sweet potato—perfect! So glad you and your hubby liked the recipe! Oh my god. 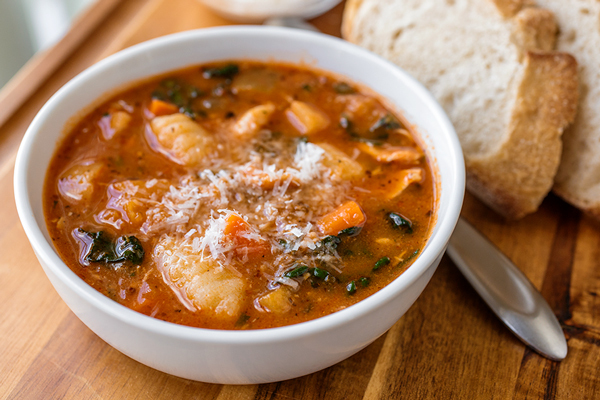 I just made this soup, and even without the gnocchi and parmesan (I forgot to grab them at the market 🙁 ) it’s DELICIOUS! There’s so much left over for my boyfriend and I that I might go and pick up the gnocchi and parmesan tomorrow just for the left over soup. This is perfect rainy weather soup. HI Clarissa, I’m stoked you enjoyed this so much! Yay! Hope you have the chance to get the gnocchi and parm, because it’ll make it that much more hearty; but either way, I’m glad you shared your experience with me and that this was a hit for you! The beginning of this post reads like a Nancy Myers film and a Diane Warren song had a love child. Anyway, this soup looks great, and I’m excited to try it. Hi Joshua, thanks so much for your kind comment…it’s a real compliment to me to imagine even a small portion of my writing being likened to a “love child” of those two, talented women. And I’m excited to read that you’re planning on trying the soup! I truly hope you enjoy it, and find some warmth and comfort in it. Delicious as written. Low fat and satisfying! Love this soup. I’ve made at least 6 times since November. My kids love it! Linda, I loved reading that! So glad even the kiddos enjoy this…great way to get some healthy veggies in them, lol! Job well done! Thanks so much for sharing with me. So this recipe has been here for awhile, but I would just like to mention that YEARS later I have still not found a better soup! I made this last night and it was phenomenal. I will definitely be making more of your recipes. Thanks so much for sharing! Hi Janice, thanks so much for sharing that! I’m so glad this recipe turned out to be so enjoyable for you, and I’m equally happy that you plan on trying more. Happy cooking to you! This soup is absolutely AMAZING! 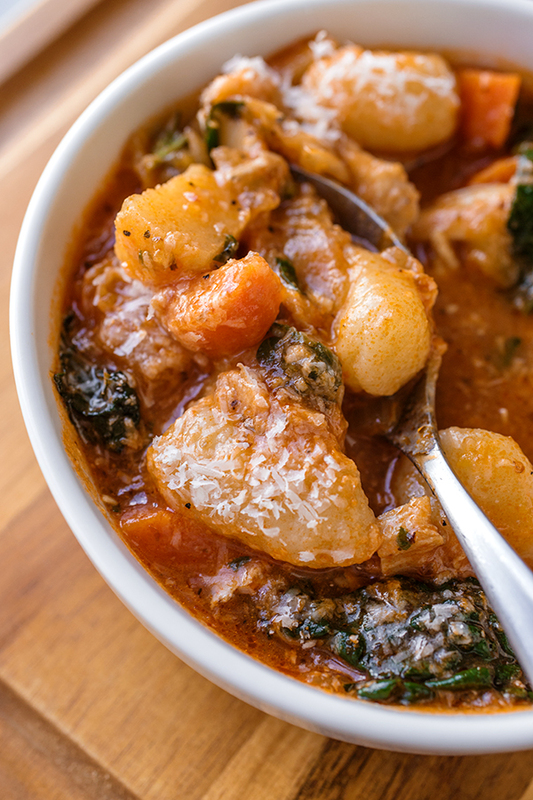 So hearty and delicious. Instead of doing chicken I added Italian sausage and broke it up as it was cooking. Next time I will do the chicken and I’m sure it will be just as good! I have a 6 and 2 year old and I know they’re going to love this soup! Syd, that is wonderful! And I do hope you share this recipe with your kids—so nutritious and belly-warming! Happy cooking to you, and thank you for commenting. Yup. This one was my winner winner chicken dinner! I have wanted to accentuate my cooking level…and this one was the bomb. I especially love the roasted garlic aspect. It truely was better than putting in minced garlic cloves right out of the fridge. Superb…and now my parents want me to become a chef. Ughh…no way. Leave that up to you! HI Kris, YOU are the bomb! You rock— how awesome you impressed your folks so much with this! 🙂 I love it. So glad you all enjoyed this recipe, and thanks so much for such a precious comment. Keep on cooking! I modified slightly but for the most I followed the soup instructions. I also added some dried northern beans. THIS WAS THE BEST SOUP I’VE EVER MADE!!!!!! Jo, that’s great! So glad you enjoyed this and made it your own! Amazing. Perfect. Followed the recipe exactly (except adding hot broth? – not sure why that matters) and it’s one of the best soups I’ve ever made. That roasted garlic is fantastic! This is sure to become a regular part of my Sunday-cooking-for-the-week rotation. Many thanks! Hi Rebecca, I’m so glad to read that! That’s wonderful! And the “hot” stock only really serves to expedite the cooking process a little, no other reason, really. 😉Thanks so much for your comments! Love this soup!! I make this every few weeks. One the stove now! Kaelee, that’s music to my ears! I’m so very glad you’re enjoying this soup so much, and I hope you continue to get lots of coziness and comfort out of it for a long time to come. Thanks so much for commenting! Can I substitute sweet potatoes for the butternut squash? Spinach for kale? Absolutely, Linda! That’d be delicious. Delicious Soup!! I have made this twice now! I add a can of rinsed cannellini beans and they make a great addition. This recipe has received many compliments from coworkers and friends! Thank you so much! Hi Melissa, thanks so much! So glad you (as well as coworkers and friends) are enjoying the soup and finding some coziness in it! Tawnia, I appreciate your comment so much! 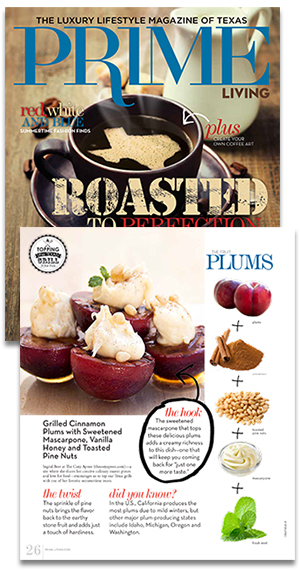 Thank you for taking some time to share with other readers you preference, and I’m glad you enjoyed the flavors in the recipe! Amazing soup! Next time will double it. Love it when folks enjoy a recipe enough to “double it” the next time! 😉 Thanks for sharing. Erika, I’m so happy to read that— thank you for sharing it with me! So glad both of your bellies were warmed by this stew, and I hope you find a few more recipes to whip up to enjoy together. Happy cooking to you! 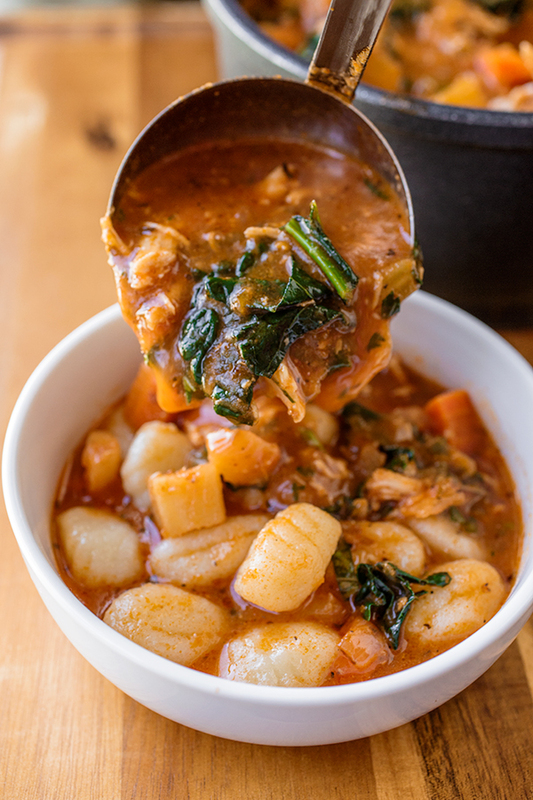 If using a pasta in place of the gnocchi, how much do you recommend using? I made this soup a few months ago for my family. EVERYONE loved it!!! Just found my way back to the recipe today with plans to re-create the rave reviews. THANK YOU, Ingrid! Laura, that is so wonderful! Happy that you’re preparing it again, and I hope you and your loved ones find lots of comfort, warmth and love within it once again! Just found your blog and am really looking forward to making this delicious recipe. Is their an adaption for a slow cooker? Thanks so much! Hi Bonnie, so glad you found it! 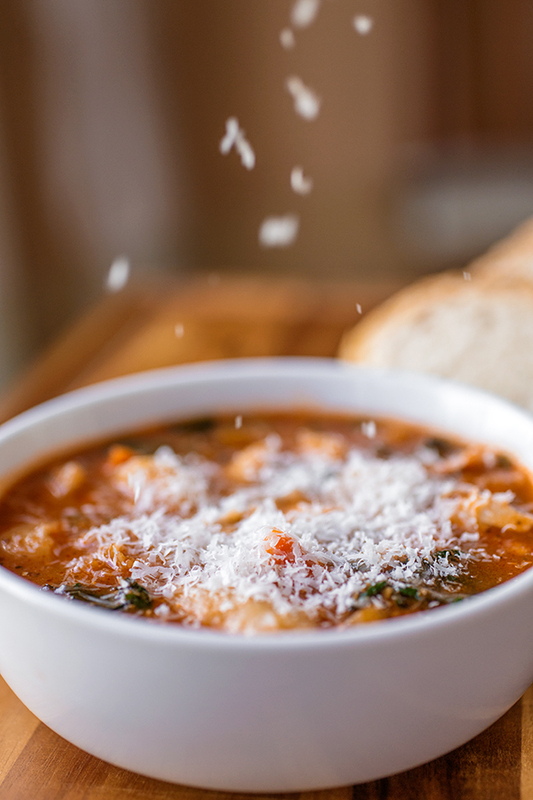 I think you’ll garner much coziness and warmth from this tasty soup. you are so sweet! just put the garlic in the oven and am prepping the veggies! cant wait to enjoy this later today. looking forward to making more of your recipes, glad i found you. btw, i found this recipe by simply typing in “best soup” on google and you were the one of the top options, lol! must be really good!! You’re kidding! 😃 That’s really great to know, thank you for sharing that info! This is my first comment on a recipe – I had to because this soup is PHENOMENAL!! Thank you for your comment, and I hope you continue to get lots of comfort and nourishment from the soup. Hi Becca, thank you so much for sharing your experience, particularly with the slow cooker—I think this will help others looking for some tips! So glad you and your hubby enjoyed, and I hope this soup continues to keep you both warm, cozy and nourished throughout the season! Made this soup today and the roasted garlic adds a fantastic flavor. Got some seven grain bread from the store and it goes very well with this recipe. 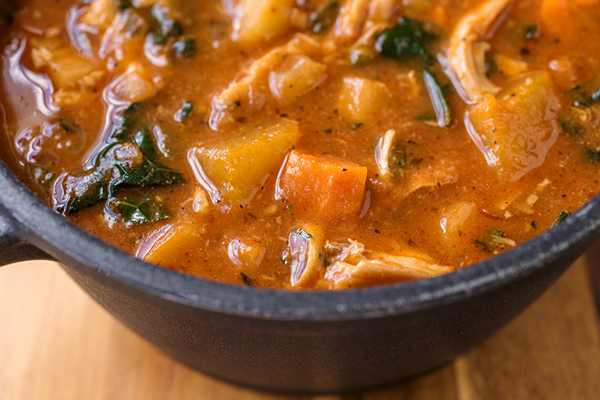 Greg, thanks so much for sharing your experience with this soup! So happy you enjoyed it, and the grain bread sounds like a delicious accompaniment! This was so good. I adapted it for the instant pot I received at Christmas. I used chicken thighs (they were on sale this week) and roasted them with the garlic in my toaster oven. Made a broth in the instant pot with bones from a store bought roasted chicken the night before. Did all the rest in the instant pot – used sauté feature to cook the veggies and garlic then stirred in the tomato sauce and stock with the cheese rind. Put the lid on and set it to pressure cook manual for 12 min. When finished I released the pressure and added in the spinach (didn’t have kale) and stirred it to wilt. added the chicken, basil and parsley and set it to sauté again just to heat it up a bit more. Served over gnocchi as instructed. Husband loved it and we will definitely make this again. I want to try with beans instead of chicken next time! 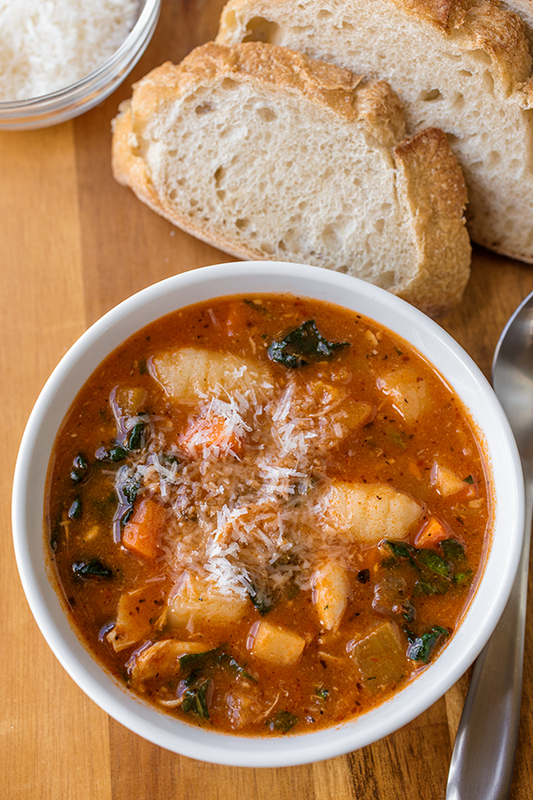 Thanks for a wonderful vegetable soup recipe! Hi Kelly, thanks so much for sharing your technique for prepping this recipe in the instant pot. I’m sure others who are looking for this type of method will appreciate it! So glad you and your hubby enjoyed the recipe and were comforted by it. And the beans would be a terrific vegetarian alternative to the chicken—good protein and fiber! Happy cooking!